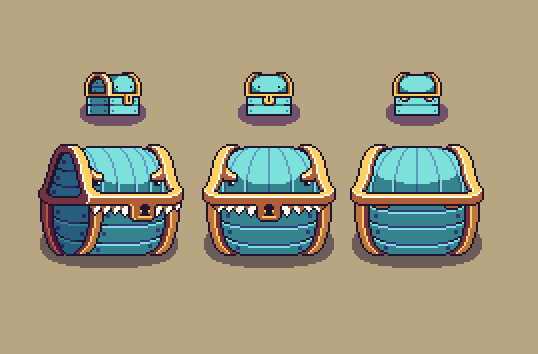 This week we’ve once more, in the spirit of having shorter design meetings but scheduling them more often, had another set of discussion regarding upcoming Grindea stuff! This time we’ve mainly focused on the next dungeon (!) and the bow. So, we’ve talked a lot about this back and forth over the years. 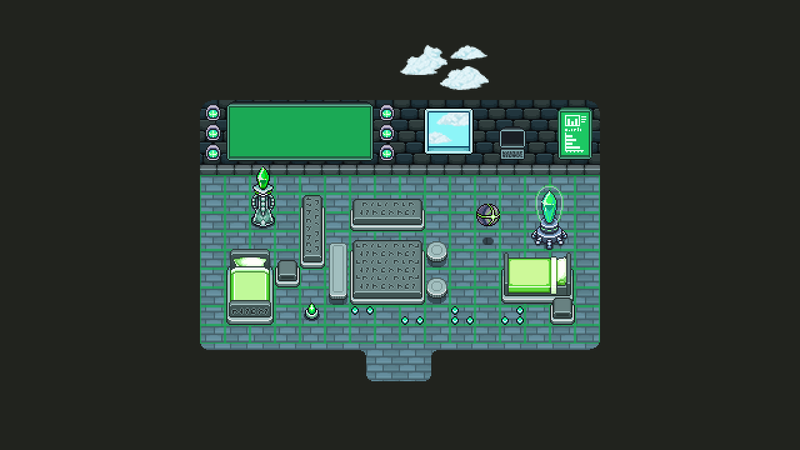 We do know we want it to be ghost/undead themed, but it’s been hard to decide on a setting, and we’ve gone from wanting it to be a ghost ship, to a ghost ship + an island, to a shrine on an island, and back to just a single ghost ship. After today’s meeting I’m fairly certain the 4th dungeon will indeed be a ghost ship, where your goal is to move from the bottom of the ship to the deck where the final artifact awaits you. 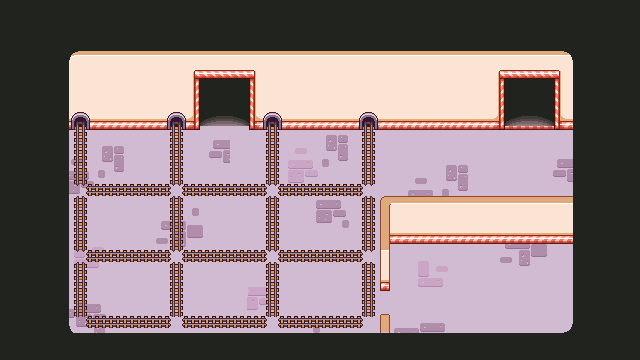 So far, in our very basic design, there will be a big floor at the bottom, which will be used as the ship’s storage area and where you’ll move through a set of rooms solving various obstacles until you get the skill used in this dungeon: an item that allows you to see into the spirit world. Some of the enemies and other.. things.. on this ship can only be seen & interacted with when using this skill. That means there might be flying swords coming after you that you can do nothing about until you have the skill that allows you to see the actual enemies! 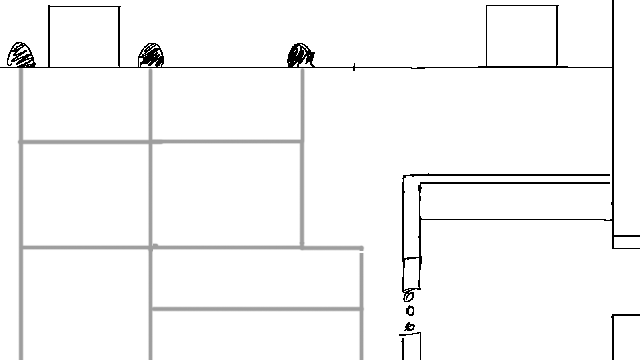 The following two floors will consist a main corridor, which you’re supposed to get through. Only there’s obstacles in the way forcing you into other doors in hopes of finding a way around the obstacles, finding enemies and challenges on the way. The ghost ship will probably be around the size of Temple of Seasons (that’s what we aim for, at least), and the main focus of the dungeon will be to use the dungeon skill to solve various puzzles and obstacles. We also talked a bit about the bow, since it’s something we haven’t touched upon a lot since it was implemented a hundred years ago! We agreed that we want to add more upgrades for the bow in general -even bigger quivers, more damage, etc, but we’re also looking into adding a bunch of talents for it (we want to add a ton of talents for basically everything, haha). Speaking of Tai Ming, we’re of course continuing to work on the final part. This week I began working the second to last map for Tai Ming: The Courtyard! 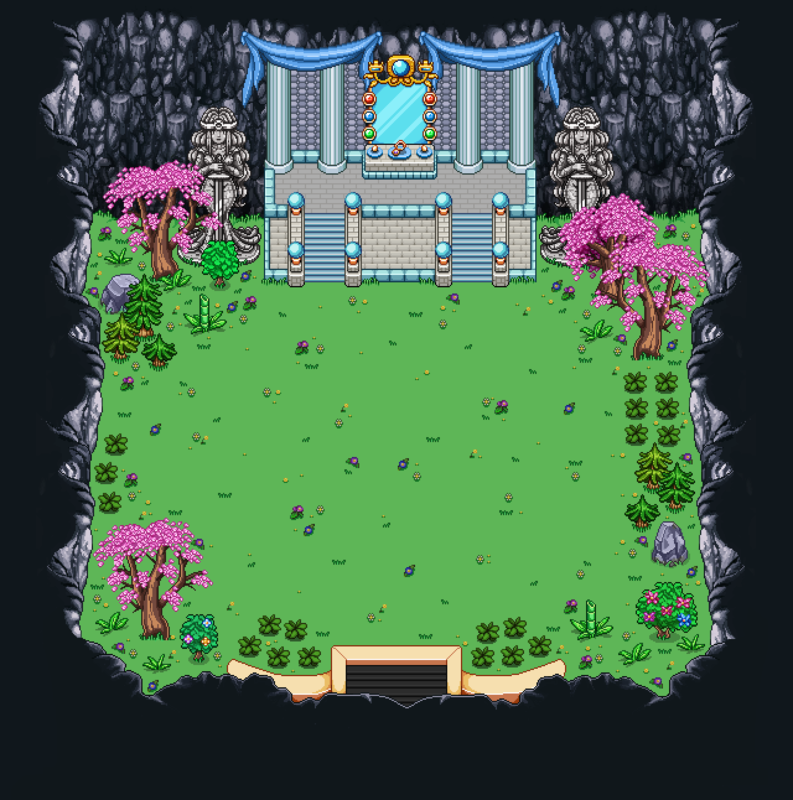 After this there’s actually only the final Boss Room (which will have a couple of variations, so it’s still a bit of work left before I’m ready to completely leave Tai Ming behind)… What a journey! A somewhat related thing we’ve been working on recently is creating a suitable effect for an upcoming battle! In this recap, I thought it’d be fun to take a look at our iteration progress as we implement and improve upon an idea. While it certainly gives some kind of effect, it also felt a bit underwhelming. 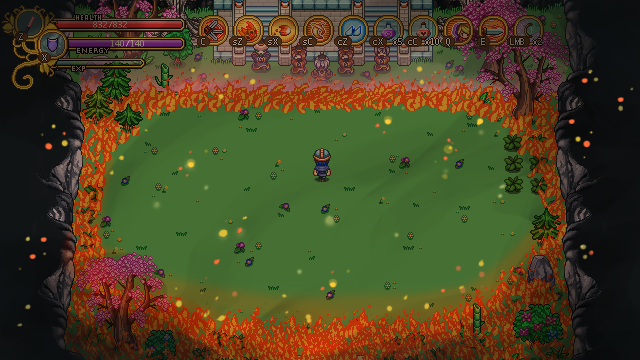 While discussing our options, we thought about making the trees and bushes burn, using another color flame and using different sizes for the flame particles, among other things, but nothing really felt spot on. During our talk it also turned out some of us had imagined the flame circle differently. 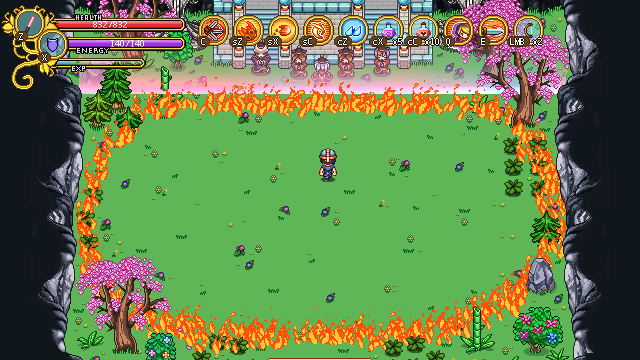 And so we went on to prototype another idea, where the fire would cover everything not inside the battle area. After seeing this in action, we all pretty much agree this is a much better direction than the first basic flame circle. And we’re still gonna add/edit a bunch of stuff! For one, the graphics are all prototype here, the sparks in the air and the flame particles will be different in the final version. We’ll also the add the burning trees and greenery we talked about after seeing the first prototype, and I’ll edit the ground to look more burnt around the flames. 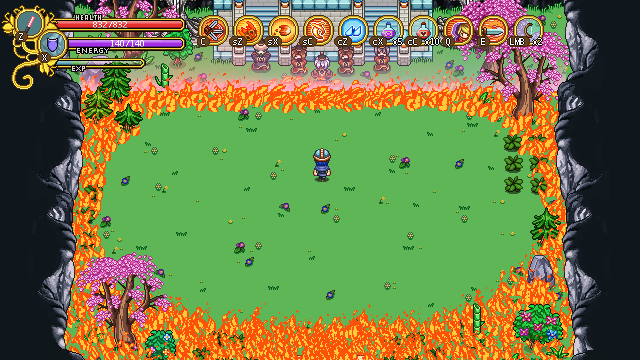 Now, we could have chosen to look at the fire circle in the first screenshot and say “this is OK, let’s keep it”. Instead, we kept pushing to make the scene better and more epic. Would it have saved us a lot of time to just stick with the original idea? Yes. Would the fight be as epic in the end? No. ….And now for something different. After some further discussing of the Housing and it’s ‘batch’ system (where you unlock a batch of x items in the furniture shop every time you enter a new area), we made a list of base items that should be included in each batch! My dream for the Flying Fortress window above is that it’ll have tiny clouds floating by, but I haven’t confirmed 100% it’ll actually happen yet. If it ends up being too time consuming to implement we’ll come up with something else (or make a loopable animation of it perhaps). Weekly Recap #255: Return to Work! Happy New Year (and we’re back)!! Have you had a nice holiday? We took about a week off to recharge our batteries, but as of last week we’ve all returned to the office to get back to work. Remember before christmas, when I (Vilya) started working on the final room of Tai Ming’s third zone? Well, over Christmas I went ahead and finished it! One big focus of this room is the shelf doors! 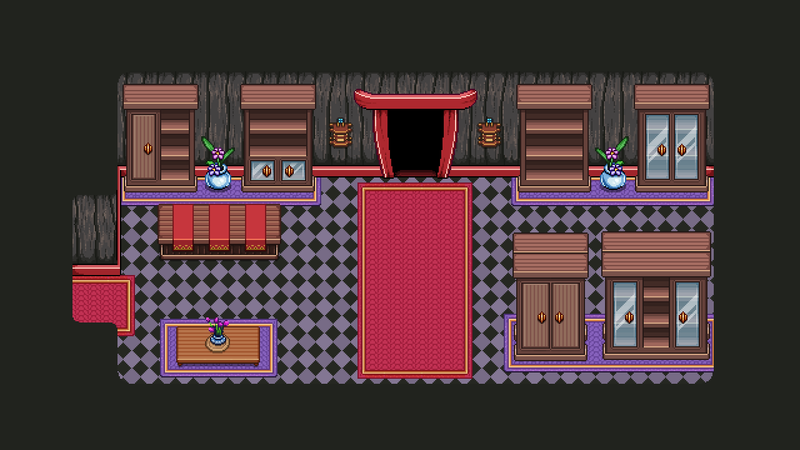 Since the shelves will hold a bunch of different items, many of which aren’t books, I thought it would be cool to add doors and make them look a bit cooler. Plus, variations and all. So I made four different sets of doors: two types of glass doors (one long and one short) plus two types of wooden doors (one long and one short). In the end the smaller wooden door didn’t get used, but who knows, maybe it’ll turn up in the future somewhere! Now, before Christmas break we had some majord design talks which I may have mentioned in a previous thread. One thing we talked a lot about was Arcade Mode. And there’s some pretty huge changes coming…! There’s no secret we want to add a bunch of new room types and challenges to Arcade Mode. We have a ton of ideas and it’s likely we’ll begin implementing some of them once we’re done with Tai Ming. However, there are more radical changes coming (though I’m not sure how soon)! First up, the town will get a lot bigger with many new kinds of special buildings, and you’ll be able to choose which ones will appear first as opposed to the way things are now, where the town slowly updates depending on your total score. This will likely be handled by putting up a bunch of indicators for what will appear where on the map (like signs or character explaining what will appear if you if you ‘choose’ that one in particular). We’re also reworking how you gain Essence! We’d like to reward everyone more evenly/steadily rather than giving almost no Essence to some and a TON of it to others, depending on how well you do on a run. So if you’re one of those who don’t typically get a lot of essence, you’ll likely get more, and if you tend to get more essence than you can handle, you’ll probably get less. There MIGHT also be another currency, or rather a rework of an old one: gold! If we implement this, you’ll keep any gold you get on your run + a bonus at the end of each run depending on how things go or how far you get (kind of the way essence works now, but gold won’t be as important so we’re more OK with the pro’s getting more of it). The gold would then be used to unlock the hats and similar items previously exchanged for Essence by the Bishop (he will keep trading perks for essence, but his other shop functions will be moved to one or several other unlockable shops which use gold), as well as other new features. So basically, Essence is used to unlock perks and town features where you can spend your gold (if the gold part gets implemented)! Whether gold gets added or not kind of depends on whether we feel there are enough cool things to spend your gold on, or if we’d prefer to keep most of it free of charge and use Essence for the rest. 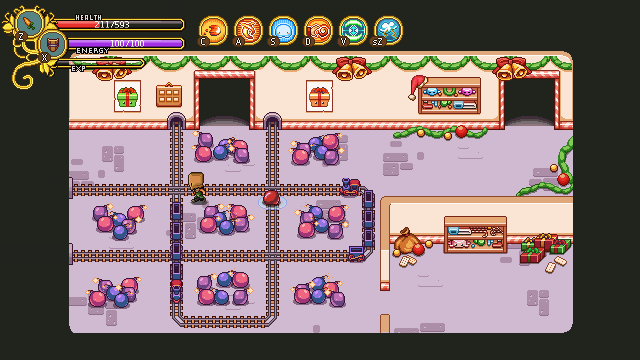 This week we’ve focused on completing the prototyping of the entire Toy Factory, as well as applying some polish to its first half. 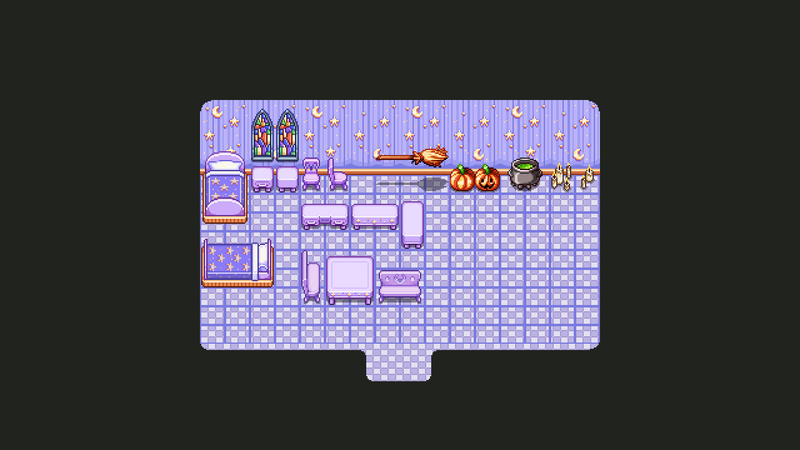 For posterity, we’ve saved all the different development stages of a challenge room, to show you what prototype iteration can look like! This was our first iteration. 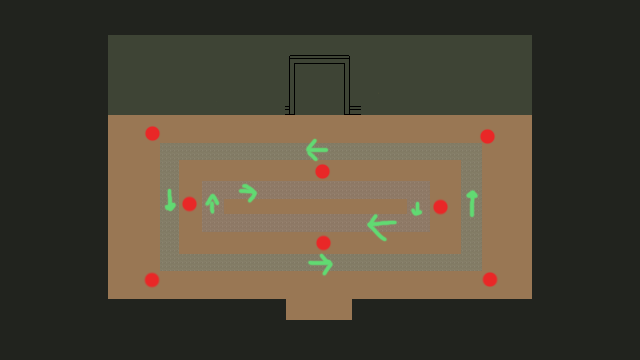 It’s pretty hard to see what’s going on since it’s all place holder graphics, but the idea was to have conveyor belts going in circles through the room (the fields with arrows), and the red dots were things you had to strike with your weapon when they appeared. The challenge was designed so that you needed to use the speed boost from the conveyor belts to quickly move around the room in order to hit the different targets before they disappeared. We implemented a prototype of the challenge, but quickly realized that it wasn’t up to par. The challenge was there, but it didn’t feel good. Sometimes, that last part is just lack of polish, but this time we felt it went beyond that. We decided to scrap it entirely. 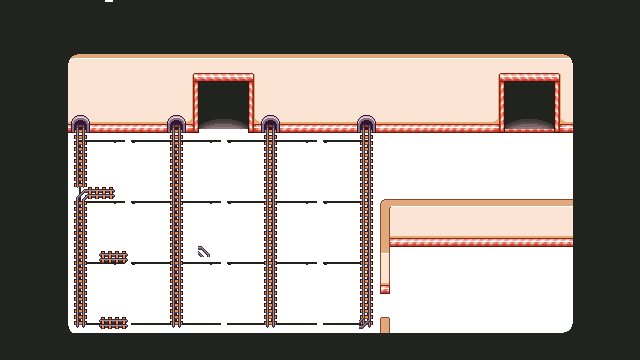 Back at the drawing board, we decided to experiment with a mechanic that was intended for the Toy Factory boss, namely toy trains. This idea was, in short, to have trains go around a track to provide dynamic area denial while having the players face a second challenge, which originally was going to be fighting enemies. 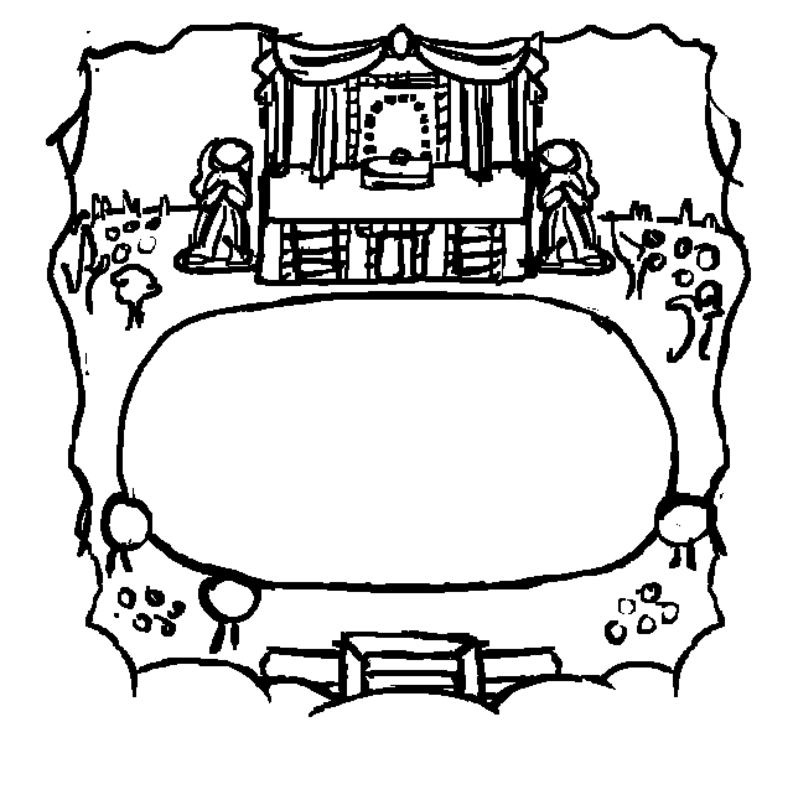 The playfield was divided into nine squares (term used loosely here). Bombs would fall inside randomly chosen squares, between which trains would zoom by on the rails. The challenge was to move between the squares, while simultaneously dodging trains. Each train crossing had a track switch, which changed at regular intervals, causing the train patterns to constantly differ. Using the map above, we implemented a prototype of the trains themselves, as well as their switching. This time, it felt interesting right off the bat, and we decided to go forward with this idea and continue iterating. This is how the background looked after cleaning things up and measuring distances. At this point, we added the falling bombs to the prototype. It felt pretty good, but oftentimes the trains would be too chaotic for player effort to actually be rewarded. You’d feel you had a good read on the situation, but then a switch changed and suddenly a train could still blindside you as you moved between the squares. We decided that by making the pattern consistent, we could improve clarity and decrease frustration while still maintaining what made the challenge interesting. In the end, this was the prototype we went for. The image above links to an animated GIF, so be sure to click on it! Note that this is still the prototype; there’s a whole bunch of polish left, as you can see, but the core gameplay is there. This little story is a good example of how gameplay can (and will) change as you go along, and that you should never expect your initial idea to be perfect as-is. It also conveys the issue of hidden/surprise development time – one of the biggest reasons it’s so damn hard to estimate how long things will take on a macro level. This is why young companies (ourselves included) so often are very optimistic in the beginning regarding how long time a game will take to make. You can look at some other game that took years to make and go “hey, I could make a game like that in six months” and you might be right, but then you never take into account all systems, sub-systems, prototypes, sprites, models, textures and lines of code that had to be made and thrown away in order for that final game to grow into existence. Some closing food-for-thought: almost every game you’ve ever played has gone through this at almost every stage of development. Even amazing triple A games has looked terrible and been a clunky mess to play at some point! Once again, Teddy have been hard at work in the Skills Workshop. This week we present the third and final skill of the Air-tree, the Wind Slash. Click to view animated gif! The Wind Slash is another projectile based skill. What makes it stand out from the rest of our skills is the way you fire the projectiles. The moment you start charging the Wind Slash, a spinning, double edged arrow appears under your character. 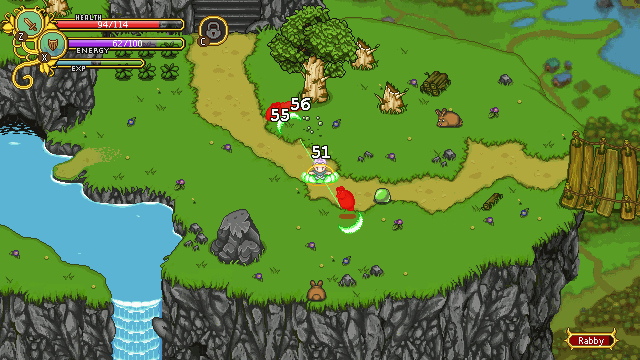 Once the charge is released, two Wind Blades will shoot out from the character in the directions that the arrow is pointing, damaging all enemies they pass through. At higher charge levels, a second arrow will appear spinning in the opposite direction, firing an extra pair of Wind Blades. This makes it possible to land double hits if the arrows are aligned during the charge release. The Wind Blade is deviously hard to control, demanding good positioning and timing. If used correctly however, it has the ability to deal tons of damage to multiple enemies at once! Other than skills, we’ve spent a good amount of time focusing on balancing Arcade Mode. Besides changing a ton of small things such as damage numbers, item costs and skill nerfs, we’re also investigating changes regarding health recovery. The health recovery is a major element that really ramps up the difficulty in Arcade Mode compared to Story Mode. In Story Mode, every enemy has a chance of dropping a Health Orb which restores some of your lost health. The chance of enemies dropping orbs is also increased the lower your characters HP gets. To top it all off, your death only means having to replay a small portion of the game! In Arcade Mode, Health Orbs can only be obtained by either clearing a floor or receiving them as a reward for clearing a Challenge or Bet. While this makes things a lot more unforgiving and challenging (which is what we want Arcade Mode to be!) it also makes it incredibly difficult to mount a come back if you’ve taken some heavy hits in a room, and if you die, that’s the end of your run. To mitigate this, we’ve messed around with adding a small health regain every time you managed to clear a room quickly enough to get the S-grade. What (we hope) this will do is promote more aggressive and risky play when your characters HP is low in hopes of receiving the S-grade and added health regain. One drawback to this is the creation of an artificial “skill bump”; a player will get better and better at a relatively steady pace, but when he starts getting S-ranks with some consistency the game suddenly becomes easier, possibly causing an unintended spike in the player’s progress. We’re still experimenting with this to achieve the best balance! In addition, or as an alternative, we’re also adding a nurse, which will appear at semi-random intervals and offer you healing for cold, hard cash. The more health you’ve obtained this way, the steeper the price! Our hope is that this will make gold management more interesting than it is now, since buying a better weapon in a shop might mean less healing if you run into a nurse, and the other way around. This solution also opens up healing to every player, regardless if they have the skill to clear a room with S-rank!